CocktailMom: Computer cable mess- conquered! I can't stand the messy look of cables behind a desk or TV stand. It drives me nuts! During the office makeover I came up with a really inexpensive way to organize them. Buy plastic tubing from your local home improvement center. 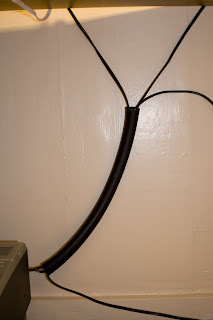 I used 1 " black washing machine discharge tubing left over from the remodel. I cut it the size I needed and then using a razor slit it open down one side. The cords all fit nicely in the tube and are no longer an eye sore. Wow. That looks great. I'm doing that when we move again this fall. I hate wires and my current mode (ignoring them) isn't looking as good as your method.